Combat Outpost Rahman Kheyl, Afghanistan — Pfc. Tasha Conger and Pfc. Tanya Redinbaugh hope their service will seem typical someday. For now, they're part of a tiny minority of female soldiers living at front-line combat positions. That could change if a national commission gets its way. The commission told Congress last month that if a woman can show she's qualified, she ought to be allowed to take any military job. The two women believe the change will come in time. "I don't know that there will be any hurry," Redinbaugh said. "It definitely needs to be done right." Conger and Redinbaugh are the only two women living among scores of male soldiers at this Iowa National Guard outpost. At least a dozen times a month, the women don Kevlar helmets and bulky body armor, pick up a pistol or rifle and join patrols of areas known to contain Taliban insurgents. If their squads are attacked, they're expected to shoot back. Conger, 21, of Seymour, is a medic. If a comrade is wounded, she is supposed to run through fire to rescue him. Redinbaugh, 25, of Neola, is a truck driver. She routinely drives hulking armored trucks down rutted roads in which the Taliban like to bury bombs. But U.S. policy says women may not hold combat jobs, so by definition, these are not combat jobs. The women are not allowed to become combat-infantry soldiers, the "trigger-pullers" who surround them here. Military rules also say female officers may not lead an infantry company, so they have no chance at an experience that can help an officer win promotion to the Army's top ranks. Female soldiers, who account for about 200 of the 2,800 Iowa Guard troops deployed to Afghanistan last fall, are particularly vital in this war. Most Afghan women will not talk to a male stranger. So if an American patrol wants to glean information and good will from local women, it must include a female soldier. The Army gets around its own gender-exclusion policy by declaring that Conger and Redinbaugh aren't members of the infantry unit they live with and serve with every day. They're "attached" to the unit, Charlie Company of the Iowa Guard's 1-168th Battalion. Conger and Redinbaugh said their kind of service in this war should help convince the powers that be that women can perform well in combat positions. They stressed that if the rule is changed, women should be required to meet the same standards - including physical tests - men must meet. "If we weren't, we'd be ridiculed," Redinbaugh said. Such tests might be harder for women to pass, she said, but a determined, fit woman could do it. Inevitably, many male soldiers relieve stress by engaging in locker-room talk. During a recent dinner, for example, two young enlisted men exchanged jibes about ___________, and their male friends guffawed. A few feet away, Conger quietly ate her meal, as if she hadn't heard or didn't care. The two women said later that they honestly don't feel uncomfortable in such situations. "Conger and I grew up with brothers, so it was a pretty easy transition," Redinbaugh said. Staff Sgt. John Alberhasky of Des Moines said the male soldiers know they'd face harsh consequences from their platoon leaders and from their peers if they ever seriously hassled the women. "Our platoon is our family. We see them as our little sisters, and we protect them," he said. Charlie Company soldiers sometimes hike several miles in thin mountain air, carrying 60 pounds or more of gear and weapons on patrol. Do the women ever slow the men down? Alberhasky smiled at the question. "No, never. In fact, we've talked about putting a leash on Conger to keep her from getting too far ahead of us," he joked as other men laughed and nodded their heads in agreement. The gender rules don't directly affect salaries. Soldiers are paid based on their rank, and everyone deployed to Afghanistan receives bonus money for war-zone duty. But the men-only rules can have practical consequences beyond the insult to women's pride. The national commission, which included several current and retired military leaders, said one of the main problems with the current rule is it denies female officers the chance to lead an infantry company. Such a post can be a crucial step toward advancement. Charlie Company's commander, Capt. Michael Minard of Bettendorf, predicted that the exclusion will be lifted someday, and female officers eventually will gain positions like his. Women who land the job can expect resentment from old-school male soldiers, he said. "There's going to be some pushback, and they'll need to be able to handle that," he said. "If the first few go well, it will get better." Minard said the military would have to make other adjustments if it wanted to add more women to infantry units. For example, he said, an Army regulation states that female soldiers must be provided with showers every few days. 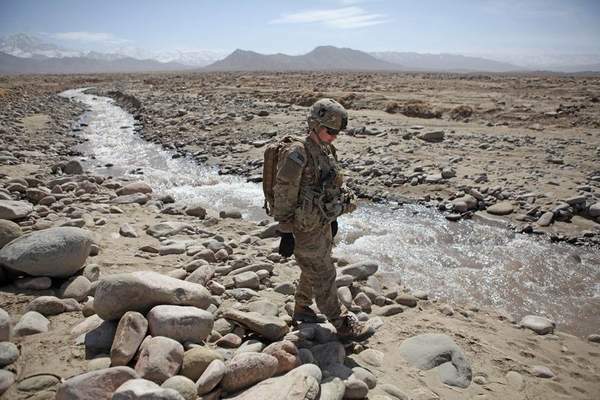 That was a problem during Charlie Company's first few months in Afghanistan, because the spartan outpost lacked running water. Male soldiers often went weeks without bathing, but company leaders had to ensure that Conger and Redinbaugh regularly made it back to a bigger base so they could wash up. The women usually could find seats on supply convoys already headed to the bigger base. But the company occasionally had to send four-truck convoys out on the rough drive because Minard had to comply with the hygiene rule for the women. The drive takes up to an hour, and each trip carries the risk of a truck being blown up. "Rules like that would have to change," Minard said. The potential for conflict was evident a few days later among an all-male squad of Iowa infantry soldiers at Forward Operating Base Mehtar Lam. When the possibility of women joining infantry units was mentioned, a soldier rolled his eyes, stood up and stalked off, shaking his head. His squadmates expressed skepticism with less drama. Several men said they doubted many women would be physically strong enough, or be as willing as men to charge up a hill and kill the enemy. "I'm not saying nobody could do it, but they'd be pretty few and far between," said Staff Sgt. Scott Murray, 33, of Princeton. The next day, a female Guard truck driver said she agreed that many women could not or would not want to pass tests to join an infantry unit. But Sgt. Shannon Osterholm said she hopes women will be allowed to try someday. Osterholm said women can get along in the boys' club atmosphere if they develop thick skins and an off-color brand of humor. "We probably make them blush more often than they make us blush," she said of the men. Osterholm said some male soldiers' wives might be uncomfortable with the idea of their husbands living in close quarters with female soldiers for months at a time. She said the military needs to work on the issue, but she added that female soldiers shouldn't face discrimination because of it. Osterholm is a Des Moines zookeeper who is on her second deployment to a war zone. She carries an assault rifle and regularly drives trucks on roads that could contain bombs. She is 27, and she noted with a laugh that some of the younger guys call her "Mom." She discounted the notion that a female infantry soldier would hesitate to charge up a hill under fire. "What she's going to see up there on that hill is her brothers in trouble," Osterholm said, "and she's going to get up there and help."